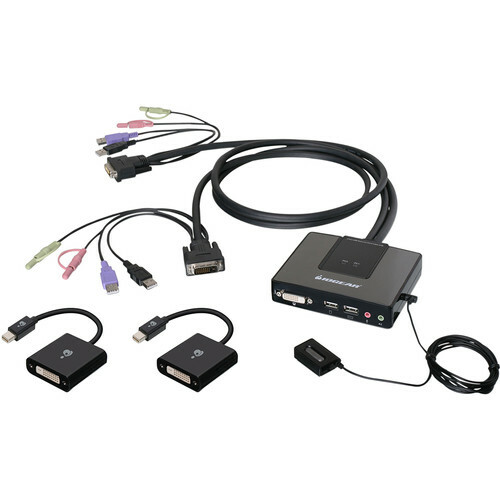 This IOGEAR kit provides one 2-Port Dual-Link DVI Cable KVM Switch with Audio as well as two Mini DisplayPort adapters, so you can control two Mini DisplayPort desktop computers with a single console system that has a DVI monitor. The adapters convert the ends of the switch's integrated cables from a DVI connection to a Mini DisplayPort interface. The Active Mini DisplayPort to DVI Adapter from IOGEAR is used to convert a Mini DisplayPort output to a DVI output. Use it to connect your computer or laptop or a DVI based display, projector, or TV. An active adapter is needed for connecting more than two displays to a video card. Moreover, this adapter supports resolutions up to 4K 3840 x 2160 at 30 Hz, and is plug-and-play compatible, so you won't have to worry about additional power plugs or installing drivers.